Red and white grapes, also called green grapes, are low in calories, with about 100 calories per cup, and provide 1.4 grams of fiber per serving. They are sweet, nutritious, refreshing and easy to pack, making them popular with busy people and kids who bring lunches to school. You may prefer the flavor of one over the other, but, although both types are good for you, the higher flavonoid content of red grapes make them richer in antioxidants than white grapes, offering you greater health benefits. The darker a grape’s skin, the more phytonutrients it contains. Brightly colored fruits and vegetables contain larger amounts of a type of antioxidant called flavonoids than their less colorful counterparts, making red grapes better for you than white grapes. One flavonoid called quercetin may help stabilize cells that release histamine in your body. Because of its antihistamine and anti-inflammatory properties, quercetin extract is used to treat allergies and, according to researchers at Maastricht University in the Netherlands, it may protect against osteoporosis, certain forms of cancer and pulmonary and cardiovascular diseases. Red grapes contain a flavonoid called resveratrol, which has a chemical structure similar to that of diethylstilbestrol, a synthetic estrogen used to treat menopause symptoms. Biochemistry and molecular biology researchers at the University of Louisville School of Medicine found that, although resveratrol may be useful as a synthetic estrogen, it also could work as an estrogen antagonist, depending on the cell type and presence of other estrogens. The resveratrol in red grapes may ease symptoms of menopause, but its reliability is still being studied. 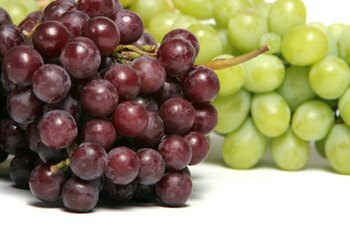 Along with resveratrol, other components in grapes may offer protection against a variety of cancers. Researchers believe that catechins, proanthocyanidins and stilbenes, all found in red grapes, may help prevent breast cancer, while the phytonutrient anthocyanins may stop colon cancer from developing. Research has also found that red grapes may protect against lung cancer. The “British Medical Journal” cites a study comparing the cancer incidence of wine drinkers and concluded that each daily glass of red wine lowers the risk of developing lung cancer more significantly than a glass of white wine. If you are trying to increase your manganese intake, either type of grape is beneficial. A cup of red or white grapes gives you 33 percent of your recommended daily intake of manganese, a mineral that helps develop strong bones and connective tissues. The Institute of Medicine recommends that women get 1.8 milligrams of manganese per day and that men get 2.3 milligrams. Older adults may protect their bone density by adding grapes to their diet. Nice, but black grapes r found here.